Gold is trading in narrow range between $1298 and $1276 for past 10 days. The yellow metal is holding strong despite strong global stock market. It is currently trading around $12. US dollar Index: strong. DXY is trading higher and jumped more than 100 pips on account of dovish ECB and Brexit uncertainty. The near term major resistance is around 96.30 (55-day EMA) and any break above targets 96.95/97.75.On the higher side any break above 97.75 confirms bullish continuation. (slightly negative for gold). US 10 year yield : US 10 year yield is slightly higher and has jumped more than 8% form low of 2.54%.The yield has declined sharply in past two months and lost nearly 22% from high of 3.25%.It is currently trading around 2.75%.Slightly negative for Gold. US 2 year yield: It is trading around 2.57%. The spread between US 10 year and 2 year has declined to 18bpbs from 30 basis point. The spread between 5 year and 2- year yield has inverted (US 5 year yield trading below US2 year yield). 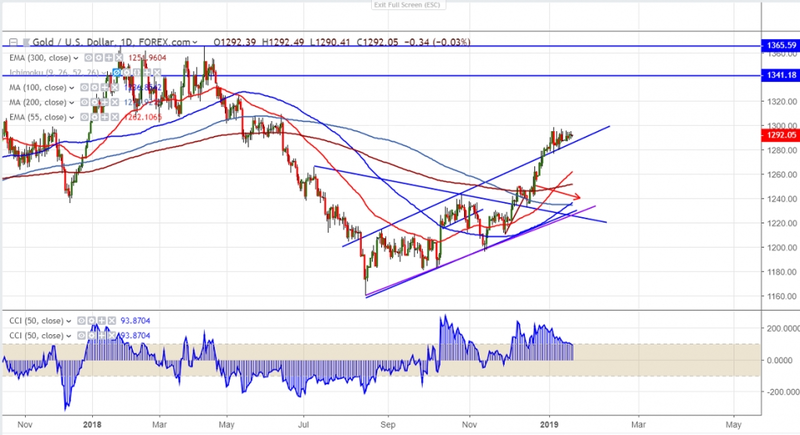 On the higher side, yellow metal is facing strong psychological resistance around $1300 and break above will take the gold to next level till $1320. The near term support is around $1276(20- day MA) and any violation below will drag the commodity down till $1266/$1252/$1242 /$1234. It is good to buy on dips around $1284-85 with SL around $1270 for the TP of $1320.